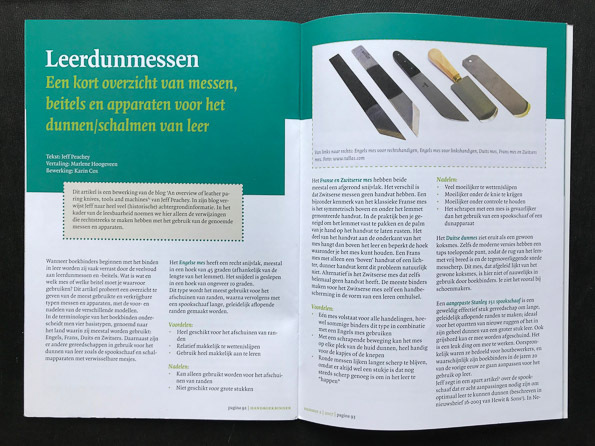 My blog post “An Overview of Leather Paring Knives, Tools and Machines” was translated into Dutch and appears in the current issue of Handboekbinden (Jaargang 10, Nummer 3, 2017): 92-95. According to Google translate, Leerdunmessen means “Learning Lessons”. Kind of cool! Added 31 Oct 2017: A dutch friend let me know that Google translation is wrong, and Leerdunmessen actually means “Leather Paring”. Thanks Edith! Congrats! Handboekbinden a nice journal to be in. It is an attractive journal, all color. Jeff, That google translation is rubbish ofcourse. I Know more examples of these strange translations. I usually just use a cheap portable electric burner. A good litho stone is more than just a convenient flat surface. It is far gentler to the knife edge than any other paring surface I know. I’ve pared on glass and marble often enough, since I have pieces of both light enough to carry to a workshop, and they both take the edge off a knife much faster than a litho stone will. In fact there are two types of litho stones, from a paring point of view. One has a greyish tinge, the other has a creamy tinge. I wouldn’t be able to tell which I had seeing just one in isolation, but with two to compare it is quite evident. The creamy stone seems to be finer-grained and softer to the knife. The greyer stones feel just a hair gritty, and take of the edge faster (though not as fast as glass). Id rather have even a greyish one than marble or glass. 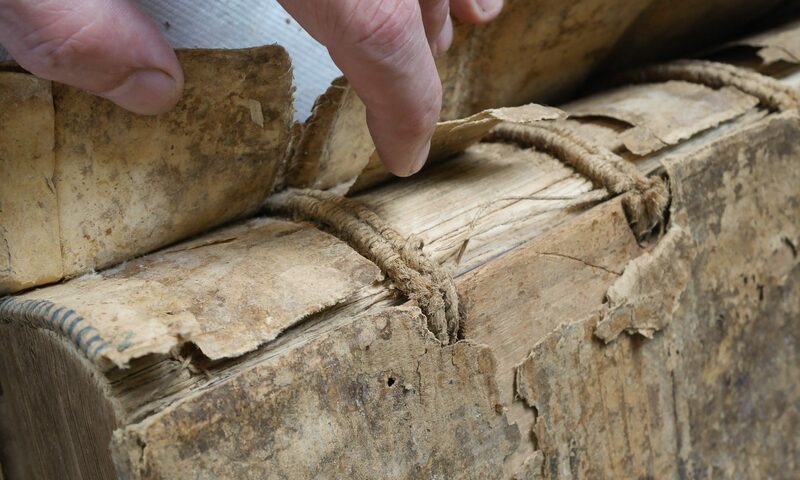 The most exotic paring surface I’ve seen was in a long-established library bindery in Oakland, California, which was closing down in the late 1980s. It was trapezoidal-shaped, about two inches thick by maybe 12 x 15 inches in its longest height and breadth. And, after a jolt of comprehension, I realized that it was the front window of a World War II fighter plane. I’ve often wished I had that glass slab; it probably went to landfill a year or two after I saw it. But if I had it, I would still pare on my litho stone. I appreciate your comments — did we have this conversation once before? — however, when I pare the knife does not dig into the substrate, it only cuts the leather. So it doesn’t really matter if the surface is litho, glass, marble or granite. And of course there are nice things about a litho stone: it can absorb moisture when covering or pasting tissue, the color is about 18% gray so it looks great in photos, some people use it as a strop, and it is a nice heavy weight. Could the airplane window have been plexiglass? Wasn’t it invented for use in planes around this time? Plexi would be far less damaging to a knife if you dig into it, and cast plexi is one of the flattest plastics around: they cast it from float glass.